The National Industrial Court has issued a restraining order against the Code of Conduct Tribunal (CCT) stopping it from proceeding with the trial of the Chief Justice of Nigeria, Walter Onnoghen. 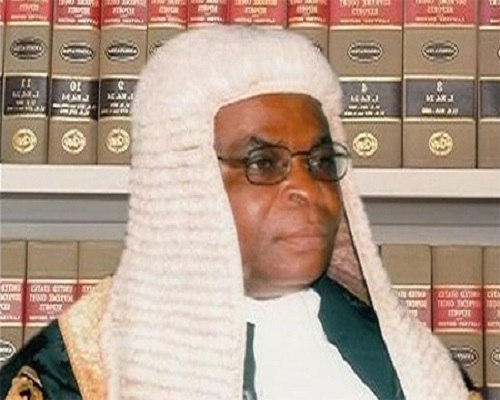 Mr Onnoghen is being prosecuted by the Code of Conduct Bureau (CCB) on six counts, for alleged false asset declaration following a petition by a group, the Anti-corruption, Research and Data-based Initiative headed by a member of the All Progressive Congress and former official the Congress for Progressive Change, of which incumbent president, Muhammadu Buhari, was a stalwart. The case earlier scheduled to begin on Monday was adjourned till January 22, after Mr Onnoghen’s lawyers argued that the defendant was not duly served with the court summons. The Abuja Division of the Federal High Court (FHC) had issued a similar order Monday afternoon, following separate ex-parte applications, seeking to suspend the ongoing trial of the head of Nigeria’s third arm of government. Although the requests made ex-parte implied that the court took its decision, without hearing from other parties, the FHC adjourned the substantive matter till January 17, after directing a service of notice to the parties to appear in court and explain why the trial should not be stopped. In a similar ruling, Friday evening, the National Industrial Court allowed another motion, ex-parte, seeking to suspend further action by parties to the matter, pending the determination of an application challenging the CCT trial. In a request brought by an applicant, Peter Abang, the court, headed by Sanusi Kado, made an interim order for the suspension of the trial pending the determination of the suit challenging Mr Onnoghen’s false asset charge at the CCT. The ruling, published on the website of the industrial court on Monday, restrained the CCT chairman, Danladi Umar; the Inspector General of Police, Ibrahim Idris and the Justice Minister, Abubakar Malami from proceeding with the hearing, pending the determination of the substantive application before the court which will be heard on January 21. The court papers seen, Monday night by PREMIUM TIMES indicate that the application included seven defendants, namely: Messrs, Malami, Umar, Idris, Senate President, Bukola Saraki, CCT, CCB and National Judicial Council. Some lawyers have said that a FHC’s restraining order against the continuation of a matter at the CCT is enough to suspend the trial, unless the order is set aside by a higher court, in this case the Court of Appeal. “The FHC is Superior to the CCT and it can order the suspension of a trial at the tribunal,” said Ngozi Ikenga, chairperson of the Abuja chapter of the International Federation of Women lawyers, (FIDA). Ironically however, a major argument against the legality of the ongoing trial is that it negates a previous decision, handed down by the Court of Appeal, which is yet to be controverted or affirmed by the Supreme Court. “The most important reason why the CJN ought not to have been charged before the CCT, let alone being prepared for arraignment is because the charge is illegal and unconstitutional. In NGANJIWA V. F. R.N, 2018, 4NWLR, Part 1609, Page 301, at page 339, para. G-page 352, para. E, the Court of Appeal (Lagos Division) held that no serving judge in Nigeria can be investigated or tried in a court of law, without first being removed from the Bench,” said foremost lawyer, Jiti Ogunye while reacting to the arraignment. Mr Ogunye, added however, that the Court of Appeal was overstretching in the privileges it accorded to judicial officers. “The position we took when that decision was handed down was that the judgment had no constitutional basis. Judges (unlike the President, Vice President, Governor and Deputy Governor) enjoy no immunity from investigation, arrest and prosecution, while they are in service. They do not enjoy executive immunity and are not covered by Section 308 of the Constitution. The Court, therefore, cannot grant to the judiciary an immunity the Constitution does not vest in it,” Mr Ogunye added. Nonetheless, this same appeal court ruling noted by Mr Ogunye and other lawyers since the commencement of this matter remains the law in the instant case and is binding on all authorities, including the federal government-led CCB and the tribunal. Unless the Supreme Court-still headed by Mr Onnoghen nullifies the appeal court ruling, the current trial is at best; ‘a prosecutorial misadventure,” senior lawyer Femi Falana noted.